My husband's Aunt Kristy makes the best pies! She taught me how. Now if she could just teach me the many other things she is amazing at, I'd be set! Here's my version for a perfectly buttery, flaky crust. Measure the water and set aside in freezer. I used a canvas mat in all of the pictures. 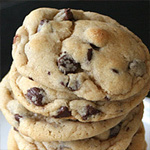 They are great because you can flour them thoroughly and the flour gets worked into the mat instead of the dough. 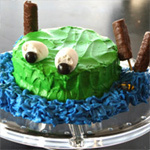 I will post instructions on how to make your own. You can of course just use the counter top, just flour lightly and check often to make sure it’s not sticking. 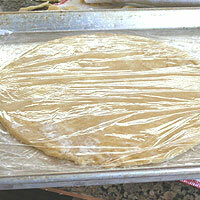 You can also roll the dough out between two pieces of parchment paper. In a large bowl measure the *flour and salt. 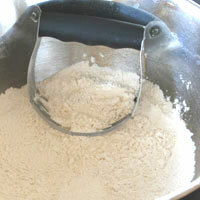 Stir well to break up any flour lumps. Set aside. Measure the shortening then cut the butter into 1-2 T pieces. 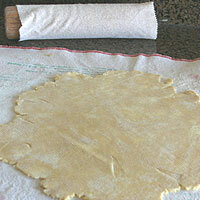 Using a pastry cutter, cut the shortening and butter into the flour mixture until pea-sized. Do not **over or ***under-mix this. Pour the cold water evenly on top of the mixture. Stir gently until just moistened. Set the first half on the work surface and push gently together to form a rough ball. It will be crumbly, but this is how you want it to be for a flaky crust. Roll out to desired size. Use a pizza cutter to cut off excess and form a circle. Slide a spatula under all sides of the dough to make sure it isn’t sticking. 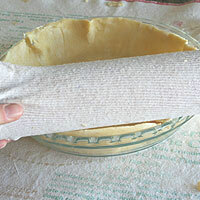 Place the rolling pin a few inches into it and gently lift the dough with a spatula onto the rolling pin. Roll the pin until all of the dough is around it. Lift and place on the side of the pie pan. Fit the dough into the pan patching up any holes or weak spots. Trim the excess or form it for a decorative look. Try to ****touch the dough as little as possible as the heat from your hands will melt the butter. Repeat with the second half. At this point you can fill and bake them, refrigerate, or freeze them. If you freeze them refrigerate to thaw. 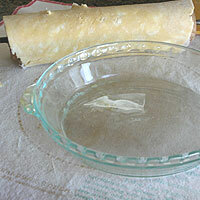 To refrigerate the dough enclose the crust filled pie pan with plastic wrap. For the second piece, place a piece of plastic wrap on a cookie sheet, place the shaped piece on top of it. 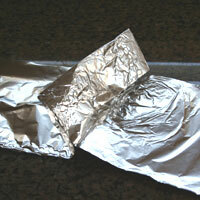 To shield the outer crust from burning, cut a large piece of aluminum foil in half lengthwise. Place piece side by side to form one very long piece. Fold to attach them. Encircle the pan with the foil leaving the top exposed and bake, removing the foil the last ten minutes or so. Underbaked - An underbaked crust, looks oily and messy, and gets soggy. Make sure the crust is evenly browned before taking it out of the oven. Too much flour - This is probably the main culprit in a failed crust. The crust will be tough and dry. 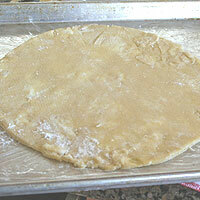 Too little flour - A crust with too little flour will be oily and messy. Overmixing - This will make the dough tough. Also the friction of mixing will soften the butter too much. Undermixing - The ingredients will not be distributed evenly. 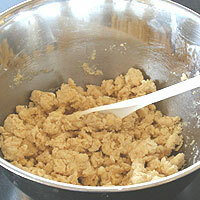 In a properly mixed dough you will have spots of butter, but not huge chunks. Touching the dough - Touch the dough as little as possible. The heat from your hands quickly softens the butter. Even if you refrigerate the dough after, it won't recover from being too soft when it was mixed. Measure the water and set aside in freezer. In a large bowl measure the *flour and salt. Stir well to break up any flour lumps. Set aside. 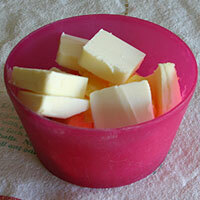 Measure the shortening then cut the butter into 1-2 T pieces. 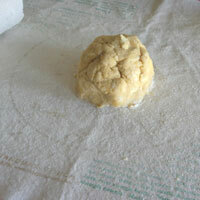 Using a pastry cutter, cut the shortening and butter into the flour mixture until pea-sized. Do not **over or ***under-mix this. Pour the cold water evenly on top of the mixture. Stir gently until just moistened. Divide dough in half. Set the first half on the work surface and push gently together to form a rough ball. 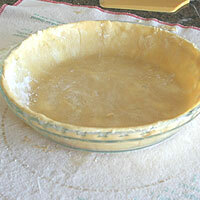 It will be crumbly, but this is how you want it to be for a flaky crust. Roll out to desired size. Use a pizza cutter to cut off excess and form a circle. Slide a spatula under all sides of the dough to make sure it isn’t sticking. 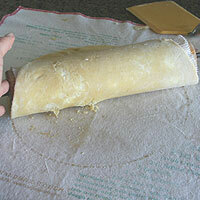 Place the rolling pin a few inches into it and gently lift the dough with a spatula onto the rolling pin. Roll the pin until all of the dough is around it. Lift and place on the side of the pie pan. Gently unroll into pan. Fit the dough into the pan patching up any holes or weak spots. Trim the excess or form it for a decorative look. Try to ****touch the dough as little as possible as the heat from your hands will melt the butter. Repeat with the second half. At this point you can fill and bake them, refrigerate, or freeze them. If you freeze them refrigerate to thaw. 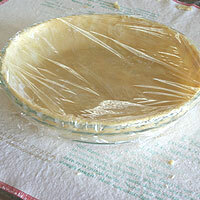 To refrigerate the dough enclose the crust filled pie pan with plastic wrap. For the second piece, place a piece of plastic wrap on a cookie sheet, place the shaped piece on top of it and cover with plastic wrap. To fill and bake: Preheat oven to 450. Fill the bottom crust with desired *****filling. Place the second piece on top. 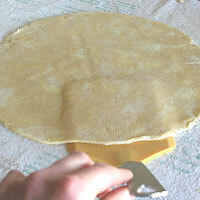 Seal the edges well and make a few slits for steam to escape while baking. Shield the outer crust with foil (directions follow). Bake 10 minutes then lower the temperature to 375. Bake until the top starts to brown. Usually and additional 25-45 minutes. Remove the foil and brown evenly. Do not under-bake, or you’ll end up with an oily mess. 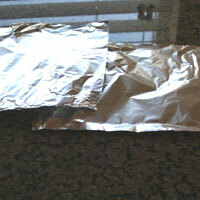 To shield the outer crust from burning, cut a large piece of aluminum foil in half lengthwise. Place the pieces side by side to form one very long piece. Fold to attach them. Encircle the pan with the foil leaving the top exposed and bake, removing the foil the last ten minutes or so. Preheat oven to 425. Prick the bottom of the crust with a fork. Spray a piece of foil with cooking spray. Place this oiled side down on the crust. Top foil with dried beans or weights on pie so it doesn’t puff up while baking. Make sure to cover the entire crust with foil so the sides don’t burn. Bake 10-15 minutes until browned. 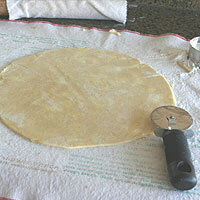 Use a pastry cutter. It will most evenly cut in the butter without overmixing it. The second best method is to take two knifes and slide them through the dough having the knives cross like scissors. Many recipes will require a refrigeration after mixing the dough. It is not required in this recipe and actually not recommended. The dough in this recipe gets way too crumbly and hard to work with this way. If you are going to refrigerate the dough, shape it first. *I have listed three methods of measuring in the instructions. 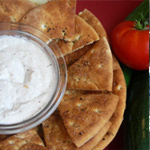 -For 2 cups minus 1 ½ T flour: Dip the measuring cup in and scoop. Take a knife and gently scrape the excess off the top. This will usually give you 5 oz flour per cup. Don't scoop too hard or too gently. 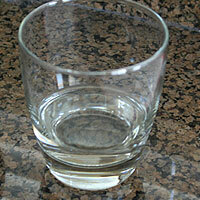 -For 9.5 oz: Use a kitchen scale. I love mine it’s the Weigh of Life digital scale. 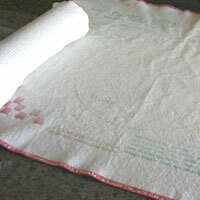 -For 2 cups plus 2 T: Sift the flour then measure it. A cup of sifted flour usually weighs 4.5 oz, so add 2 cups of this plus 2 T to get the right amount for this recipe. **Overmixing the dough will make it tough. Also the friction will soften the butter too much. 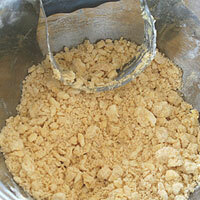 ***Undermixing the dough will not distribute the ingredients evenly. 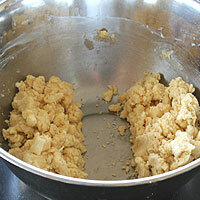 In a properly mixed dough you will have spots of butter, but not huge chunks. ****Touch the dough as little as possible. The heat from your hands quickly softens the butter very quickly. Even if you refrigerate the dough after, it won't recover from being too soft when it was mixed. *****I refer to an old cookbook of mine when I make a fruit filled pie for the sugar and flour ratio. 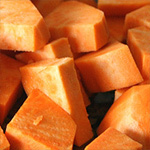 I think good fruit can't be improved upon, so I try to keep spices to a minimum and bring out the taste of the fruit.